Unlike most skiers in New Mexico, I like to slide horizontally, not vertically. I also prefer groomed trails where no dogs, snowshoes, or snowmobiles are allowed, preferably through tall trees. That’s because I grew up in Minnesota with cross-country ski trails at the end of my street. My parents, descendants of Swedes, had a regular Saturday morning ritual: They would bundle up their five kids in triple layers and bribe them into the sub-zero-degree day with a few hours of cross-country skiing followed by a giant breakfast at the local greasy spoon. While I still remember the misery of frostbitten toes, the frozen slime mask that formed around my face from breathing through a scarf, and never being able to catch my dad no matter how hard I skied, I’m more grateful to my parents for teaching me how to cross-country ski than just about anything else they taught me. I’ve found that there’s no better way to clear my head and reset my default mode to “joy” than a few hours in the winter wilderness gliding on snow, feeling my appendages work in harmony while working up a good sweat. I change my style and ski-and-boot setup depending on snow conditions—electing either classical (the traditional method of cross-country, skiing in a parallel groomed track) or skate skiing (which looks like ice skating on groomed corduroy)—but the feeling I get with either is nothing short of phenomenal. Plus, it’s a cheap high: At most groomed cross-country areas, skiing is generally $10 to $20 per day, or roughly one-fifth the cost of a downhill lift ticket. The only change from my childhood ritual, now that four decades have passed and I live in New Mexico, is that I eat breakfast first (a green-chile-and-bacon breakfast burrito from El Parasol in Española) and travel a lot farther to find groomed cross-country trails. It’s a challenge in a state tectonically designed for downhill skiing. To improvise, I sometimes wake before dawn to skate-ski loops around the beginner Magic Carpet run of Ski Santa Fe. Or I’ll drive an hour west to the seven-kilometer Pajarito Nordic Ski Trail, near Los Alamos, possibly the only place on the planet that requires showing an ID at a nuclear-site checkpoint en route to the area. These small hits of corduroy mildly satiate the junkie in me. But for a real fix, I need the Enchanted Forest Cross Country Ski Area, three miles east of Red River. My once-husband turned me on to this spidery 33K trail network, shrouded by aspen and ponderosa, when we moved to New Mexico in 1995. A competitive biathlete, that rarefied Nordic skier who also fires guns at targets along the way, he had heard about the legendary mom-and-pop operation from a Russian skier, who heard about it from the University of New Mexico Nordic ski team coach. The Lobos host an annual ski meet there, and definitely have the home-court advantage: The Enchanted Forest covers six hundred acres and tops out at 10,040 feet, which makes it arguably the highest Nordic ski area in the U.S.
I’m meeting Goins for a pre-ski chat inside the Enchanted Forest’s “Day Lodge.” The 1,500-square-foot building is an ever-expanding maze packed with wooden tables surrounded by orange pleather benches, rental skis, communal coffee cups, and a very large array of Nordic nostalgia. On the “Snow Shrine,” a shelf of trinkets above the wood-burning stove, there’s a stuffed squirrel, a skiing Santa Claus, and a yellowed newspaper article about how beer is the best workout fuel. Goins, 44, is an ebullient, blue-eyed astronomer who works summers in Bryce Canyon National Park. He and his wife, Ellen, bought the business from her parents, John and Judy Miller, in 2010. The Millers opened Enchanted Forest in 1985 after running another Red River institution, Powder Puff Mountain downhill area (now closed). They sold it after they skied California’s Royal Gorge, the largest Nordic ski area in the country, for the first time. 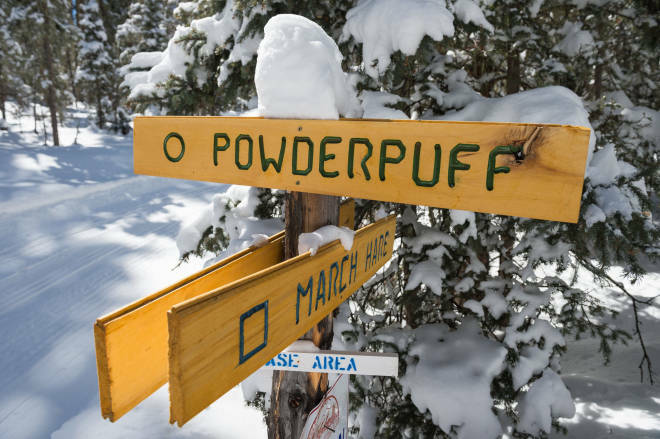 So enamored were they with the aerobic joy of groomed trails, they decided to carve out a similar playground in the Carson National Forest, and worked out a deal to lease a few hundred acres from the U.S. Forest Service. The Millers, who are now both pushing 80, still ski almost every winter day. As does their daughter, Mary, who happens to walk in the door as Goins is telling me how trail names like Face Flop Drop, Peter Pan, Little John, and Malaboggen (Mary’s childhood nickname) came to be. “It’s a nickname I despise,” Mary tells me as she laces up her ski boots. But the name lives on in trail maps and on painstakingly carved trailhead signs, all 235 of which Goins recently re-carved by hand. “This place has been a labor of love for 27 years,” Mary tells me as she walks out the door and grabs her skis. Depending on the snow and how fanatical you are about grooming, there are four excellent spots in New Mexico to find regularly groomed ski trails, both classical (skiing in parallel groomed tracks) and skating (skiing that looks almost like ice skating on groomed trails). Most ski areas groom the same trail for both skating and classical, with four to five feet for skating in the center and a parallel track on the side for classical skiing. This nearly 7K network of skating and classical trails is tucked into a forested canyon northeast of Pajarito Mountain Ski Area. Southwest Nordic Ski Club volunteers groom and maintain the trails. Trail access is free, but donations are welcome. For trail maps and information on how to join, visit swnordicski.org.